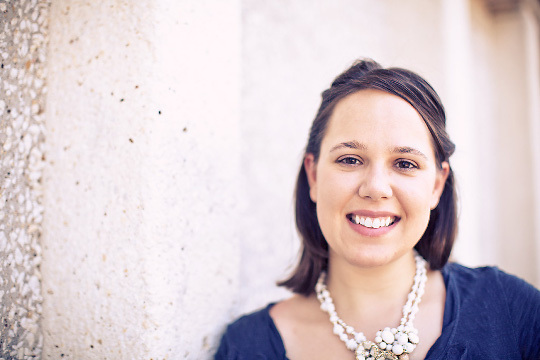 Sometimes, on occasion, when times are tough to save a buck – a bride might let a family member or friend address their wedding invitations for them. I am in fact a big supporter… until something like this happens. A very kind mother of the bride called me a few weeks ago in a bit of a panic – rightfully so, her family member calligrapher accidentally addressed the outer envelope address on the inner envelopes and visa versa. Oops! So she called me to do a bit of mending by addressing new inner envelopes for their new crunched time line. This is just one example of how a professional calligrapher can come to the rescue! Okay – it’s really a bronze envelope, but I love alliteration. Love these beautiful, large bronze envelopes with a custom lavender ink in the citadel font I completed a few weeks back. 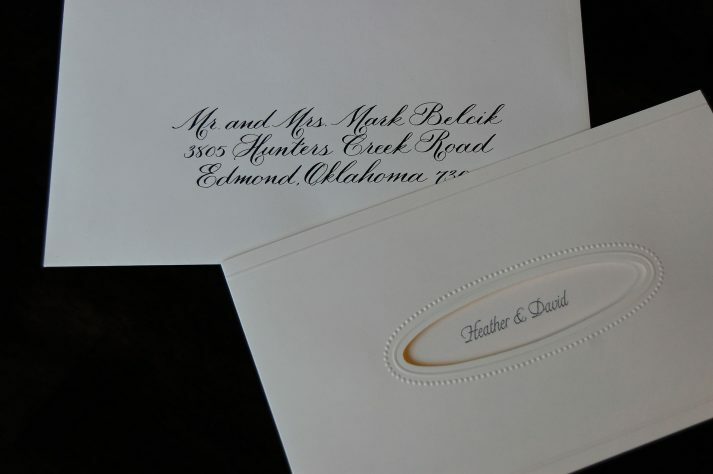 A lovely wedding at the Rosewood Crescent Hotel calls for a lovely rook font in classic black ink. The invitations are so unique with the embossed windowed envelope and simple grey thermography on the invitation card. For a 2 year anniversary. 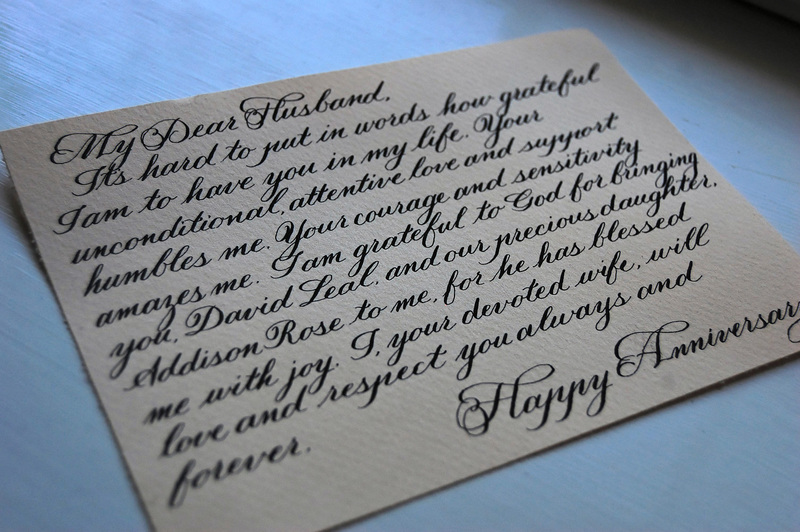 My sweet client asked me to write a heartfelt love note to her husband for their anniversary. It was written on a 5×7 piece of paper to be paired with a photo of the same size and framed. I think it is the perfect gift. Well – now that I am finally being a good blogger and posting photos… I realized how popular Citadel has been this season. 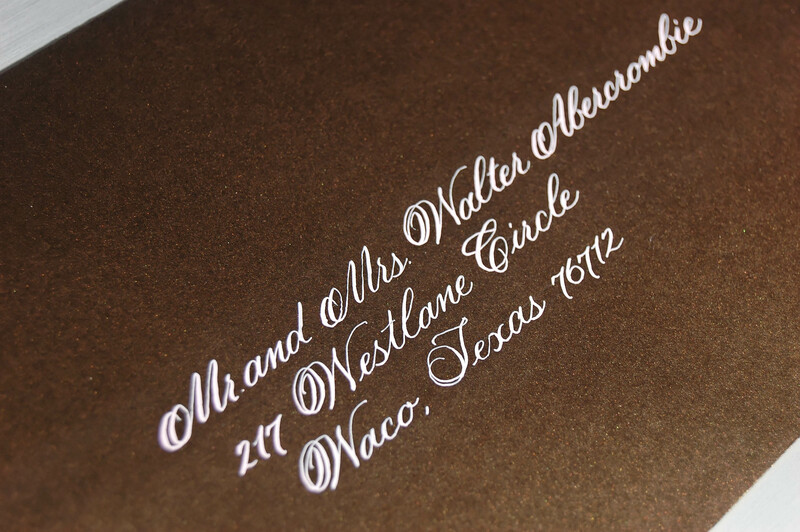 It really is a nice meeting ground of the classic elegant copperplate and something a bit more elaborate like Talia or Grace. These lovely invitations came from Wedding Paper Divas and had a nice square envelope.